Ky lib�r na kujton nj� histori t� lavdishme t� ungillor�ve q� n� dit�t e hershme deri m� sot. Lutem q� per�ndia ta p�rdor� p�rkthimin fuqish�m n� kish�n shqiptar�. Florenc Mene, Lushnj�, Shqip�ri. The cost of bringing the Gospel to the Albanian people has always been high. Here are some of the people who have made the attempt and the price they have paid. 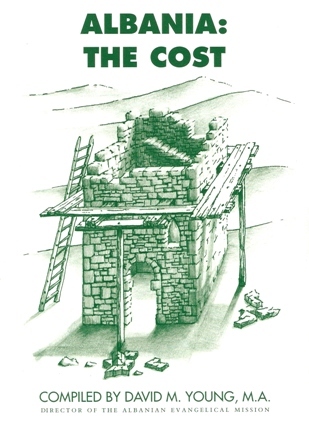 the title is based upon the Lord's parable of the man who began to build a tower without first sitting down "to count the cost, whether he has enough to complete it". This book is offered in the hope that its readers will follow the example of those who paid the full price required of them in making Christ known to the Albanian people. [This book reminds us of a glorious history of Evangelicals from early days to the present. I pray that God will use the translation powerfully in the Albanian church]. Florenc Mene, Lushnj�, Albania.